This simple Slow Cooker Chicken Tortilla Soup is a delicious and budget friendly meal for the whole family during this busy back-to-school season! This post is sponsored by Hannaford. I was compensated for my time. All opinions expressed here are my own. My girls are back in school. My younger daughter is in third grade this year, and loves her teacher! My oldest, please save us, started middle school!! My days at the house are much quieter, but overall our schedule is jammed packed. Now that we’re a couple weeks into classes resuming, I have settled back into a routine, and I am feeling like it is all more manageable. The first few weeks were just a game of catch-up. Now you can find me doing roughly the following: After CrossFit, I stop in at Hannaford, try not to get to side-tracked when running into other moms I know in the aisles and discussing what school-to-home communication is like in the middle school, the whereabouts of yellow eye beans, and the sugar and fiber content in granola bars. I assemble the ingredients for a day or two and head into the kitchen to work on recipes or photography or whatever the to-do-list brings. I try to get to the pile of emails before Judy T informs me that her super sensitive doggie ears can detect the school bus at the bottom of the hill. A few minutes later and the girls are bustling about the kitchen, unpacking forms for me to fill out, emptying lunchboxes, and fixing snacks. Then we’re off to tennis lessons or ballet or whatever that afternoon’s activity happens to be. Mondays are the most hectic now and I don’t get home until 7:30. (Is this the direction my days are going now that I have a middle schooler? I am sure some of you are in the same boat if not later. Please let me know in the comments below.) 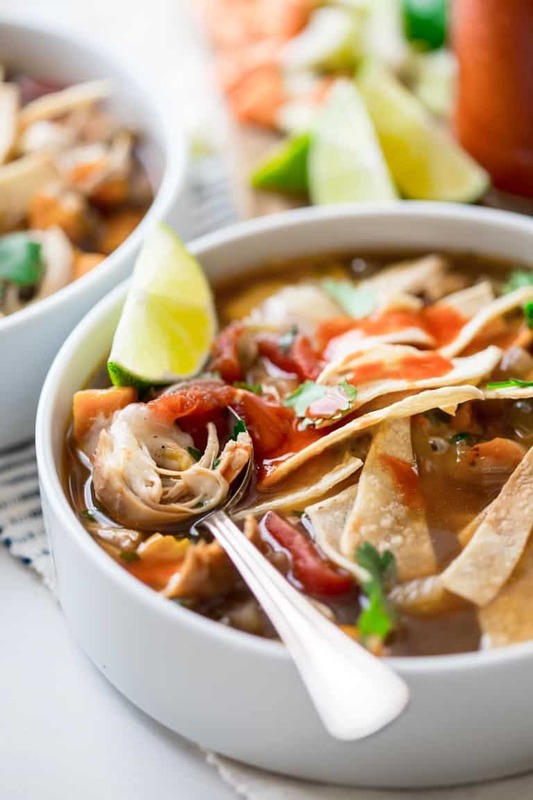 Anyway, it’s on those days when this budget-friendly Slow-Cooker Chicken Tortilla Soup comes to the rescue. It’s super easy to get going when I get home from the store. Just stir the ingredients together and set the timer for eight hours. Did I mention how inexpensive it is?! I calculated how much it costs per serving. I stuck with the Hannaford Brand for the most value-friendly ingredients to keep the price in check. I also used the Natures Place All Natural Boneless Skinless chicken breast. 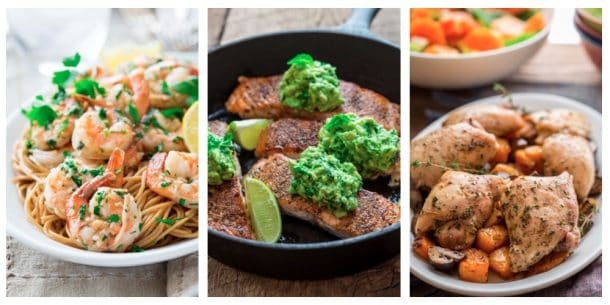 The total recipe worked out to cost only $2.32 per serving and the Hannaford Brand products are just as high in quality as name brand products that cost more. I used low-sodium chicken broth, lots of spices and garlic for the broth. Then I added in onion, celery and carrots for added nutrition and bulk. Next comes chicken, just drop it right into the broth, and let the slow cooker work its magic on it to braise it into tender shreds. I also used Hannaford Mexican Style Stewed Tomatoes. They cost only 55 cents a can, but they improve the flavor of the whole dish so much. The fun part is that we can top each bowl of soup, as we like. I let the girls top their own. Jase and I use a heavy hand with the hot sauce and lime. My little one likes to sneak on extra cheese. 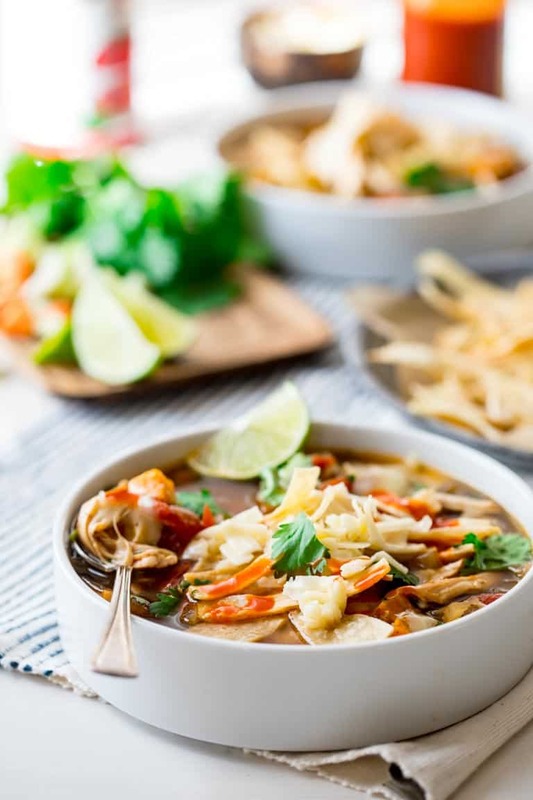 Everyone loves the crispy tortilla strips that soak into the soup. It’s so good that it is the latest addition to the Best of Healthy Seasonal Recipes. I can’t wait for you to try it! If you make this recipe, please be sure to come back and let me know what you think. 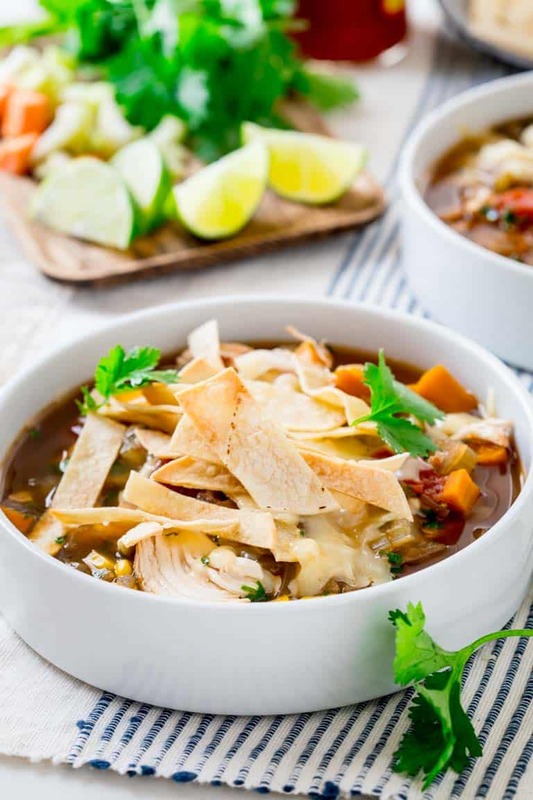 Use low-sodium chicken broth — If you use regular chicken broth in this chicken tortilla soup recipe, your soup will be way too salty. However, if you can’t find low-sodium broth at your grocery store or simply forgot to buy it, scale back on the amount of salt you add to the soup and it should turn out fine! Add more chili powder if you like things spicy — To kick up the heat a bit in this soup, feel free to add in a little more chili powder or chipotle chili powder. If you’re serving this soup to kids, I’d recommend using the specified amount of chili powder and topping your soup with lots of hot sauce instead. Store the tortilla strips separately — Even though the tortilla strips taste amazing on top of the soup, you don’t want to mix them all in at once, otherwise they’ll become a soggy mess in the slow cooker. 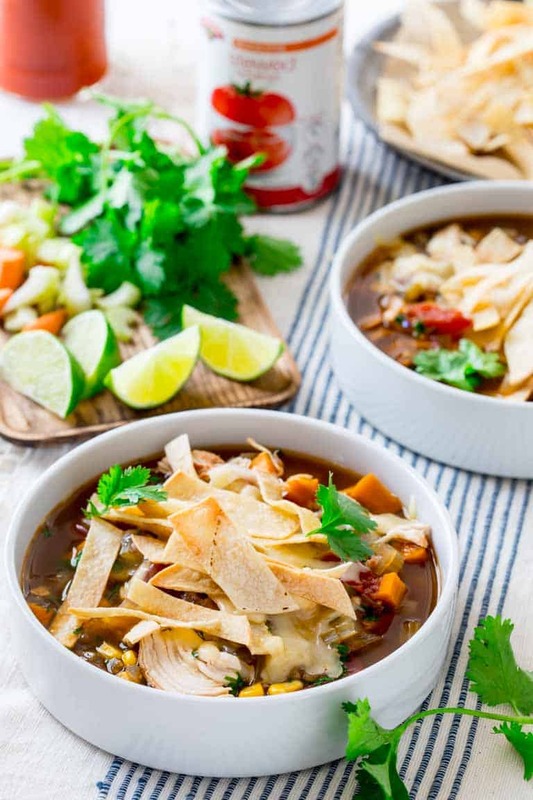 Sprinkle the tortilla strips on when you’re ready to eat this slow cooker chicken tortilla soup, and save the rest in a plastic baggie in the meantime. Connect with Hannaford on Facebook, Hannaford on Twitter, and Hannaford on Instagram. 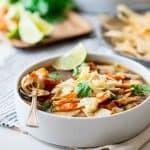 Healthy and easy Slow Cooker Chicken Tortilla Soup with shredded chicken and corn and veggies. Topped with homemade baked tortilla strips, cilantro & lime! Whisk broth, garlic, cumin, chili powder, salt, chipotle chili powder and cinnamon in the insert of a large slow cooker. Add onion, carrots and celery hearts and stir to combine. Submerge chicken breast into the broth and vegetable mixture. Crush tomatoes by hand over the soup and add tomato liquid. Cover and cook on low for 8 hours. Meanwhile, preheat oven to 350ºF. Lay tortillas on work surface. Brush with oil and cut into strips. Spread on baking sheet. Transfer to oven and bake until the strips are golden and crispy, 10 to 12 minutes. Remove from the oven and let cool. Store at room temperature until ready to serve. When timer goes off, remove the chicken breast from the soup to a cutting board. Shred with two forks. Return the cooked chicken to the soup, and stir in corn, cilantro and lime juice. Ladle soup into bowls and top with cheese and tortilla chips. Pass hot sauce and lime wedges. Make sure you’re using low-sodium chicken broth or this dish will be too salty. If you substitute regular chicken broth, use ¾ teaspoon salt. I’ve never made a tortilla soup, but I really love it! 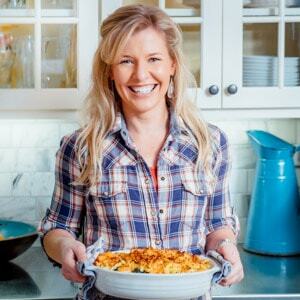 I need to try your recipe because it sounds perfect for crisp fall weather! Chicken tortilla is one of our favorite soups! I can’t wait to try your variation! I love it too Jessica. Hope you enjoy it! Thanks so much! Love how easy this is to make! It’s the perfect addition to our fall dinner menu! I really loved the flavor- even without searing the chicken! Thanks for visiting my friend. I have never had a soup with tortilla…it looks so beautiful and delicious. Thanks so much! It’s one of those times when a little bit of soggy is a good thing… sort of like stirring crackers into chowder. It’s super yummy! Hope you try it Angie! YUMZ! I love love all the slow cooker gems this time of year. So low maintenance and so delicious! They are so simple to get going in the morning, and really save the day in the evening! This would be great for game-day! I hadn’t even thought of that, but it would be great to serve for football! What a fun way to serve it, and I love the idea of everybody customizing theirs. This looks amazing! I just pulled out a bunch of leftover corn tortillas I had stored in the freezer from a summer party we had. Now I know exactly what I’m going to make with them! Hope you enjoy this EA, and thanks for stopping by! Loved this!!! I didn’t have chipotle chili powder so I added some red pepper and a little jalepeno, left out the celery and added black beans because I was out of corn. There were no leftovers. Everyone gobbled it up! Fresh and filling. Love your site! Thank you for expanding my meal plan with healthy meals! Thank you so much for coming back and letting us know how it went. I really appreciate your taking the time to do so! Have a great weekend. 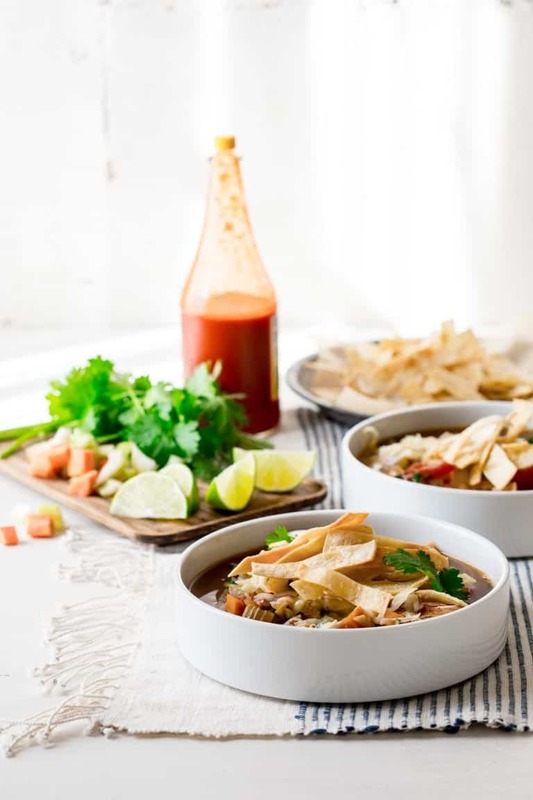 I adore chicken tortilla soup, it has so much flavour and so many delicious ingredients which work so well together, great recipe! Love how you educate us step by step, I really love learning the tricks for cooking! What type of onions should we use? Is there any difference using white, red or yellow onion when we are caramelizing? Thank you! Hi Andry, You can read all about onions here in my produce spotlight. https://www.healthyseasonalrecipes.com/produce-spotlight-the-ultimate-guide-to-onions/ There are some tips for caramelizing. Any color works, but sweet onions have the most sugar and will give you the sweetest caramelized onions. For this recipe, no need to caramelize, and any color works. I use yellow onions in most cases.